Casa de las Letras is a rural house for rent in a unique natural and rural environment, the region of Matarraña (Teruel), facing the incomparable setting of the Ports of Beceite and next to the Terra Alta (Tarragona). Come and visit charming villages such as Horta de Sant Joan, Beceite, Valderrobres, La Fresneda, Cretas or Calaceite. Breathe the calm of small towns like Lledó. Enjoy cycling excursions on the Vía Verde or hiking through the amazing landscapes of the Puertos de Beceite Natural Park. 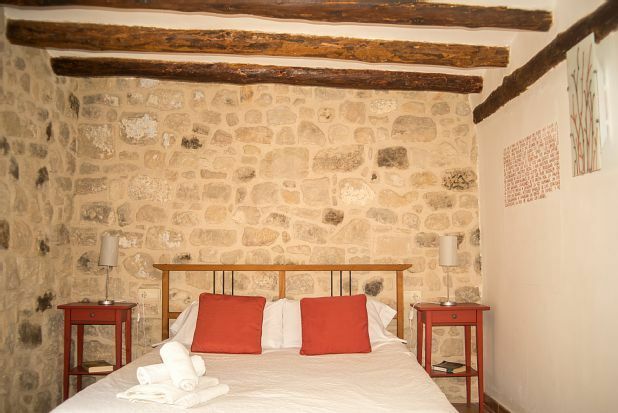 Casa de las Letras is the best accommodation alternative in Matarraña and Terra Alta. Accommodation in a rural environment consisting of an old house with four floors plus an annex barn. It is located in Matarraña (Teruel), in front of the Ports of Beceite and Horta de Sant Joan (Tarragona). Recently renovated, it has been transformed into three spacious independent houses equipped with kitchen and appliances, which can be rented together or separately. Ideal for families or groups of friends. Toys and children's stories available to children. Estamos pasando un fin de semana estupendo en Lledó. A pesar del temporal de lluvia, la casa está perfectamente equipada y neustra estancia está siendo genial. La naturaleza está viva y los campos brillantes tras la lluvia. Pero tendremos que volver, en dos días que pasaremos en el Matarraña ni de lejos nos da tiempo a hacer todo. Y queda pendiente un viaje en mayo para ver los almendros en flor. Lugar ideal para desconectar. Trato inmejorable por parte de la propietaria. Excelente casa, espaciosa y muy limpia. Muy buena ubicación para excursiones por la zona. Disfrutamos mucho en familia. Repetiremos! Gracias por esta estancia fantástica. La casa preciosa t totdo muy limpio. La propietaria muy atenta y nos dió mucha información sobre el entorno. Hay muchos lugares bonitos que visitar cerca. Sin duda volveremos algún día, hemos estado genial. La recomendamos! Lo pasamos genial, el entorno es muy bonito y la casa es muy acogedora. Repetiremos! La casa es grande y muy acogedora, el entorno muy agradable y con muchas posibilidades, y el trato fué inmejorable. Fantástico alojamiento en un entorno inigualable. Nos alojamos una familia con niños. La casa está perfectamente equipada. La zona de la Matarraña es preciosa con un gran patrimonio arquitectónico, nosotros estuvimos de visita en Varderrobres, un pueblo muy bonito. The Matarraña is a region of great scenic and cultural interest. Lledó is next to the Natural Park of the Ports of Beceite. In addition, the Via Verde, a path designed to travel by bicycle or hiking is an ideal alternative for any age and physical condition. The charming villages of Matarraña, the Valderrobes castle, the jails route or the numerous Iberian ruins are other alternatives. In addition, the proximity to the coast, and the situation of the Ebro Delta, just 40 minutes, make the MAtarraña the ideal point from which to enjoy a quiet holiday in a rural setting, and with the beach at three steps. The Tarragona area and its World Heritage ruins, as well as the aquatic parks of the coast or Port Aventura are other alternatives at a prudent distance (less than an hour and a half).